Scientists at Disney Research have figured out how to harness one of the most readily available, yet hard-to-capture sources of electricity. And they’ve created a dead simple, open source device based on that technology that anyone can build with low-cost materials. The energy harvesting technology generates triboelectric or static electricity by touching, rubbing or sliding paper together. 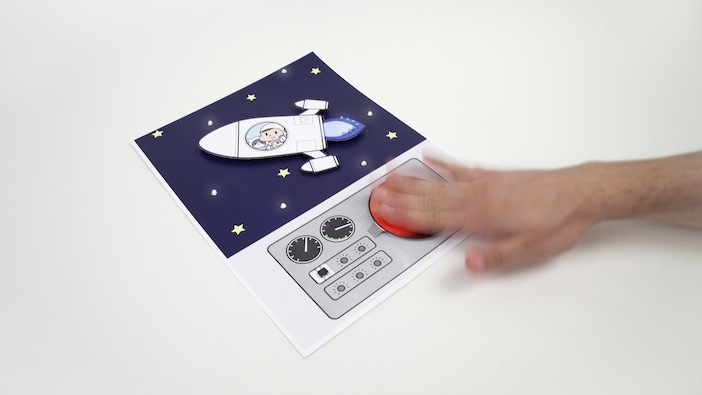 Flexible Teflon paper is placed between two conductive layers. A charge accumulates on the Teflon sheet when paper is rubbed against it, just like rubbing a ballon on your hair. Like most simple designs, it conceals great complexity. The technology uses electrets, materials with special electrical properties used in microphones and tiny MEMS devices. If the conductive elements move relative to each other against the Teflon sheet, a small, alternative current is generated. The current is low, but the voltage can be as much as 1,000 volts. That’s enough to power a row of LEDs, e-paper displays, infrared devices, or even to communicate with a computer. The innovation is the work of Ivan Poupyrev and his colleague Emre Karagozler. Poupyrev is the principle research scientist at Disney’s Interaction Technology Group in Pittsburgh, Penn. Poupyrev, who gave a presentation at World Maker Faire New York about making the entire world interactive called “Hacking the Un-Hackable”, specializes in interactive design and was in Scotland this week to present his invention at the ACM Symposium on User Interface Software and Technology (UIST). He and his colleagues at the lab began with a basic question: How can we create a new form of power generation devices? He says using triboelectricity is a first. He imagines applications in books, postcards, clothing, and other uses, but hopes the maker community will come up with other uses of the new energy source. What uses can you imagine for this technology?